MBA candidates at Auburn speak very highly of their peers. Many are “busy [juggling] their work and family” so at times it can “be hard to connect with them outside of the classroom.” Fortunately, they are still “very friendly” and are always “helpful when doing projects together.” Students are also quick to report that their classmates are “easy going” and “highly intelligent.” For the most part, they all seem to make a concerted effort “to contribute their opinions and share in class.” This appears to be greatly appre¬ciated as they often “provide [great] insight” and “bring great examples of real-time issues.” Another student attempts to illuminate life at Auburn by stating, “There seem to be distinct groups: younger students, who participate in activities and clubs and hang out on campus vs. those like me, who come to school for class and then leave as quickly as possible.” And while one graduating student claims that her peers are “interested in learning, but not overly involved in activities,” another student delights in telling us that the school holds “an annual international festivity [and] several masquerade balls as well.” Additionally, “tours and trips to different places are available.” Athletics play an important role in the social life on campus, particularly in the Fall, where SEC football reigns supreme. Auburn’s football team won the BCS National Championship in January 2011, and tailgating activities before each game provide an opportunity to network with alumni and other students. Intramural sports are popular; outstanding golf courses are nearby, and the beaches of the Gulf of Mexico are 3 hours away by car. Since 2008, an International study trip of 10 days in length has been built into the cost of the program; each Spring groups of students and faculty travel to desti¬nations to learn about doing business in those countries. Previous student groups have gone to Argentina, Brazil, China, France, Germany, South Africa, and many other coun¬tries. Students say that this trip is a highlight of their Auburn experience. Atlanta is a 2 hour drive from Auburn, and provides a popular big-city weekend road trip destination, as well as permanent employment location for many students after graduation. Nearby Columbus, and Georgia, Alabama also offer plenty of entertainment options and distraction from schoolwork. Sports enthusiasts rejoiced when Auburn acquired the Biscuits, a minor league baseball team affiliated with the Tampa Bay Devil Rays, while the Columbus Cottonmouths provide an outlet for ice hockey enthusiasts. Columbus is also the home of Fort Benning, one of the Army’s largest bases. The Office of Professional and Career Development serves the Business school’s entire undergraduate and graduate student population. The career specialists understand that job hunting is an in-depth process and provide the tools and techniques for success. They help students develop and implement an effective job search strategy, showing them how to create a marketing plan and craft a target list of potential companies. Additionally, they host numerous seminars and events, offering students everything from resume writing workshops to mock interviews. The office also hosts several career fairs each academic year. The College attracts companies hiring students into consulting roles such as Accenture, CapGemini, Deloitte, Ernst & Young, KPMG, and Quorum Business Solutions, as well as major companies focusing on supply chain management, including Exel Logistics, Home Depot, Lexmark, Target and Walmart. Financial services organizations including AFLAC, BB&T, BBVA, Regions Financial, and SunTrust, as well as the FDIC, Federal Reserve, OCC, the Alabama Securities Commission, and the Georgia Department of Banking and Finance also recruit Auburn’s Business students. 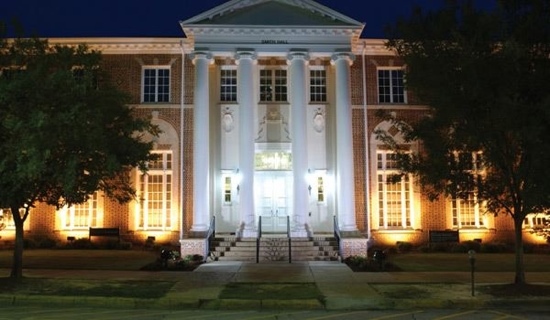 The Auburn MBA Degree requires completion of 36 semester hours (minimum) and 17 months start-to-finish. Eight of the 12 MBA Curriculum classes are core/required classes; four elective courses may be selected from options across a wide variety of academic areas. Auburn MBA students may choose a dual-degree track and earn a masters degree in engineering or management information systems concurrently with their MBA Degree. Two years; two degrees. Fall Semester: Integrated Business Project and Strategy Case Analysis (core class); Elective #2; Elective #3; Elective #4. Graduation in December! Fall Semester (all core/required classes): Financial Analysis; Quantitative Decision Making; Strategic Analysis & the Competitive Environment; Organizational Leadership & Change. Spring Semester: Consumer Marketing & Theory (core class); Operations and IT for the Competitive Advantage (core class); Cost Analysis (core class); Elective #1. Summer Semester: MBA Internship/Study Abroad (both possible). The Center for Ethical Organizational Cultures facilitates the adoption and maintenance of ethical organizational cultures. The research focus will include Western Civilization philosophy in developing a methodology to assess and facilitate the development of organizational cultures. The Center for International Finance and Global Competitiveness will support research, instruction and outreach activities relevant to international financial markets and global competitiveness. The Lowder Center for Family Business and Entrepreneurship combines research, instruction and outreach programming in the areas of entrepreneurship and family business. International student organization active on campus and is available to all students. Minority advancement program available on campus and is available to all students. Informal study groups formed on ad-hoc basis open to all MBA students. Want more info about Auburn University, College of Business Distance MBA? Get free advice from education experts and Noodle community members.